A new state of the art purpose built facility houses this major television network. The customer had moved in just 3 months prior to approaching Maintcomm, due to a safety audit report, sighting OHSW & public safety concerns. The building being (at the time just 5 months old) required a range of products that had to achieve a high grade architectural finish. 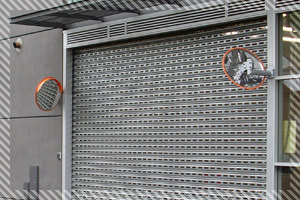 To achieve the finish & to comply with OHSW guidelines, we supplied Marine Grade Polished Stainless Steel external convex mirrors, with fabricated & powder coated 80mm O/D custom mirror brackets. This gave employees entering & exiting a 25m view perspective. These mirrors are able to withstand extreme weather conditions, are super tough, unbreakable & highly impact resistant & the most importantly - the customer wanted them to be maintenance free. 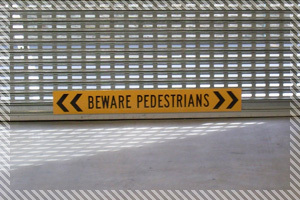 Coupled with these mirrors, we designed, manufactured & fitted custom "Beware - Pedestrians" signs that mount directly to the security roller doors. As part of our approach, we had a local well known window tinting firm attend site & fit security film to the external windows. "Andrew, Maintcomm has delivered a high quality end product coupled with the attention to detail. The mirrors & signage are top grade - you exceeded our expectations. Nothing is a problem for you fella's. And thanks for relocating the height clearance bars too." Tony - Station Operations Manager, Major Free to Air Television Network.